The Velvet Pirate Coat – Would I Wear it in Paris? Also known as the Coat for the Oaf. He wanted a blue wool one that more closely resembled a military coat, but then he pointed out that when he buys me clothing items he never consults me on color and fabric. So there. The thing is on hold right now, but it is turning out just gorgeous. 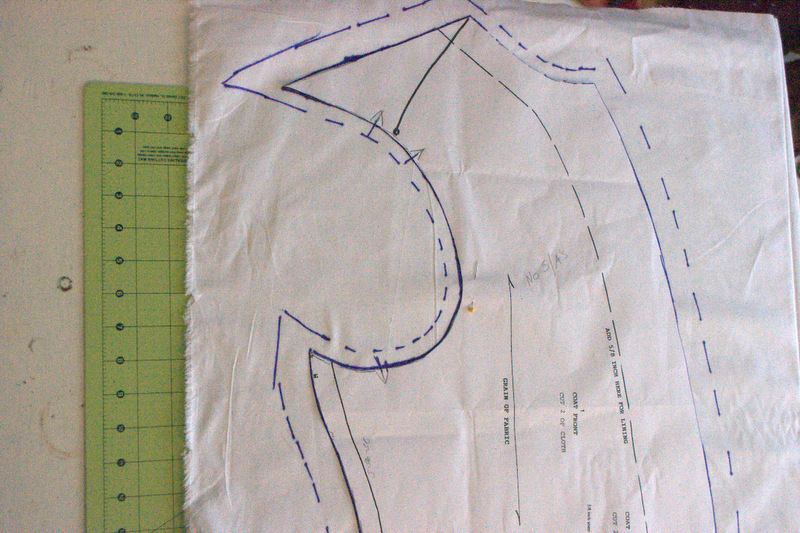 This is a shot of the brocade lining which will also be used for the turnbacks and collar, and maybe the pocket flaps. 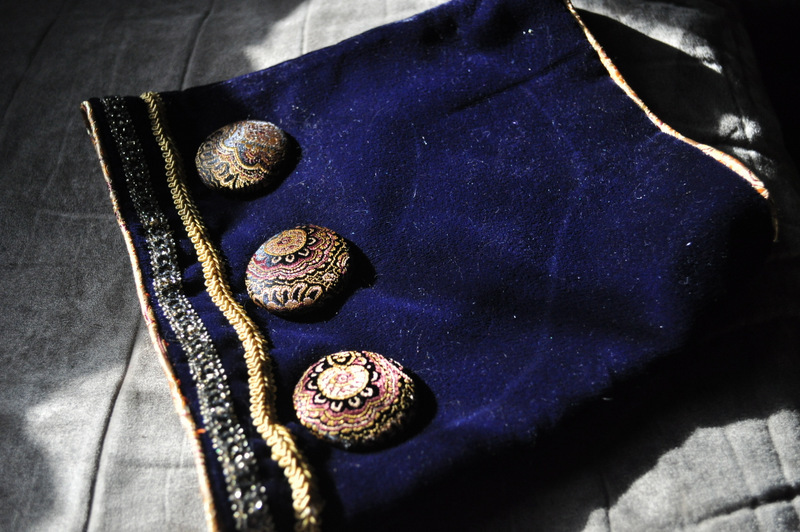 Those are covered buttons using the lining fabric. And the edge has piping which I haven’t done in a long time. I like my piping to be nice and tight which this isn’t, but it’s not too bad. These are a lot of fun, but a lot of handsewing. I don’t mind the handsewing if I have plenty of back episodes of Project Runway to watch! Funny, while it was in the muslin and fitting stage, I called it Coat for the Oaf. 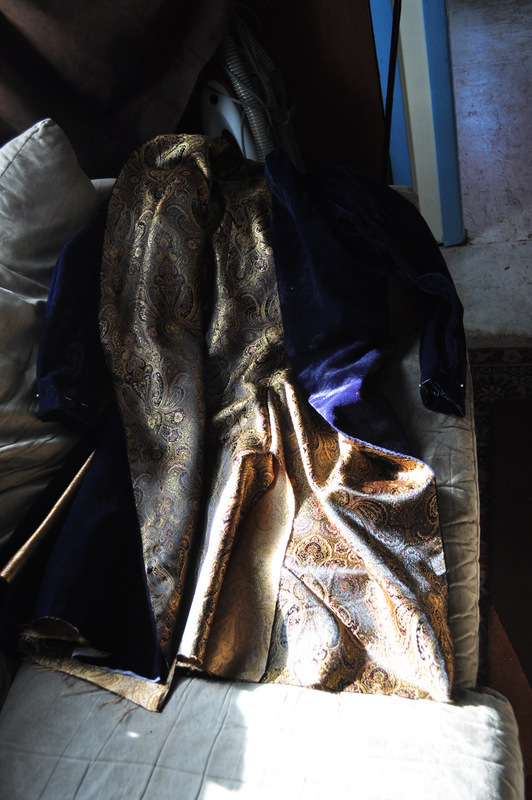 But once I cut and sewed the velvet and brocade, it became the Pirate Coat. 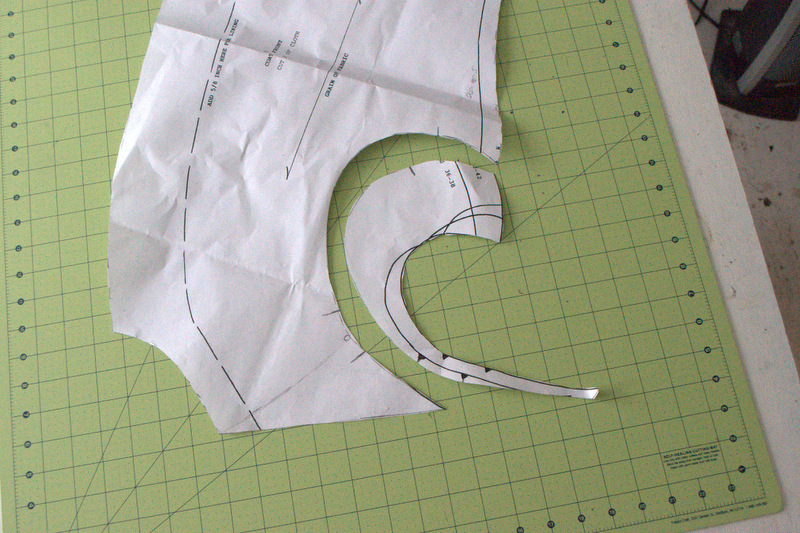 I cut all the seam allowances off the pattern pieces while I was fitting it. Then I drew on wide ones for the sides and shoulders and narrower ones for the underarms and armscyes. I had to really dig out the underarms and then I added gussets! While this coat may be beautiful, I’m not entirely sure it will be wearable for long. A confetti of seam allowances! I love a two-piece sleeve myself. The pattern is from Patterns of Time, but if I were to make another one, I think I would try to find different pattern. It seems like an accurate pattern and it is sized for modern men as far as I can tell, but I have had a devil of a time with the the sleeves and armscyes. The seams of the sleeves don’t match up with the seams of the coat–which I think is correct–but the notches and dots don’t make it any easier and I put the sleeves in wrong more than once. 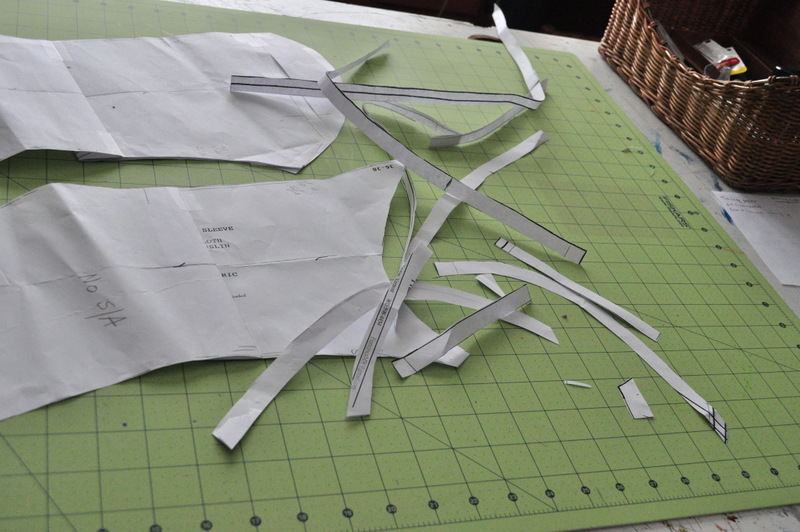 It is a tricky cut because the shoulder seams are towards the back a bit and slant downwards. 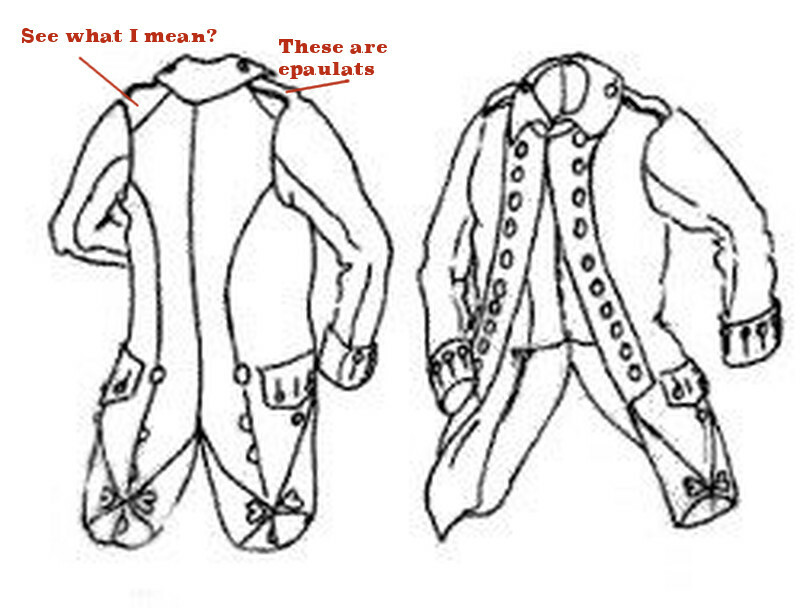 Excuse me, how do you spell epaulets? Most modern clothes have the shoulder seam straight down the shoulder, so that the top of the sleeve cap matches up with the shoulder seam. Not so much historical clothing. I hafta say, with all the pita’s this coat has presented, it has been fun to make. And I really hope my husband can wear it. When I put the mock-up on him, it completely changed his posture and stance. He glided up to the mirror like a fine gentleman–and that was just the lousy muslin! Just found your blog,and really enjoyed you posts.